(1) Rake was increased to 12 coaches from Hereford to Chester and back - additional vehicles were Pullman cars 'Aquilla' & 'Christine' (car 64). (2) Gordon Lacy comments: An excellent outing, never more than 12 minutes out of time. Although beset somewhat by clearance slacks, these were adequately allowed for. The highlight of the whole day being Hagley Hall's superb run back from Hereford carving 18 minutes out of the schedule, & storming past Abergavenny at 74mph in the dark! 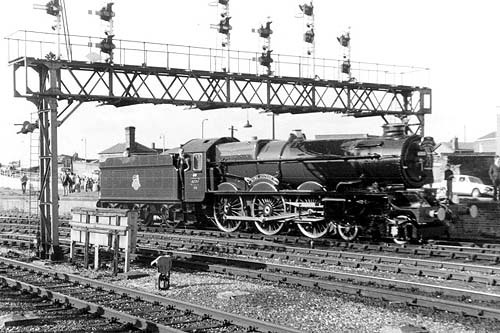 (2) May have run in conjunction with the Great Western Society? 4930 upon arrival at Hereford on the way northwards. 6000 at Chester after coaling and watering. Taunton 08.45d ? 21.50a ? Bridgwater 08/56 ? 21/38 ? Worle Jn 09/08 ? 21/26 ? Bristol Temple Meads 09.26a ~ 09.30d ? 21.04a ~ 21.08d ? Filton Jn ? ? 20/56 ? Pilning 09/43 ? 20/50 ? 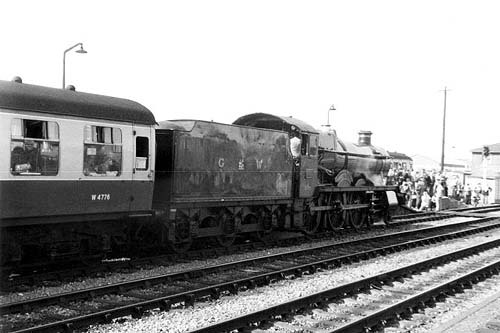 Severn Tunnel Junction 09/49 ? 20/44 ? Newport 10L00a ~ 10L15d ??.?? ~ 10.19 20L24a ~ 20L34d 20.18 ~ ??.? ?